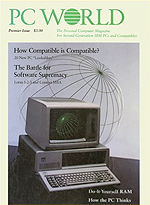 The year 2008 marks the 25th anniversary of the publication of the first issue of PC World. That means we've seen more history than nearly any other magazine or Web site that covers personal technology. As with history of any sort, much of the most interesting stuff happened in the early years. In the course of its first decade or so, PC World went from idea to successful product to globe-spanning enterprise with editions in most of the world's major countries. So we asked a few folks who there when we were young to share their thoughts on the making of PC World. Consider this an oral history of our origins, even though paricipants actually contributed their memories via e-mail. Many of the PCW staffers had been working on PC Magazine in its pre-Ziff-Davis incarnation in a series of offices (above a vacuum cleaner store, behind a tax preparer, above a Japanese restaurant) on Irving Street in the Sunset district of San Francisco. Just before Thanksgiving, the whole staff was summoned to a meeting in a Thai restaurant down the block (the nearest place that would accommodate the whole staff), where Ziff-Davis emissaries announced that they had just acquired the magazine. The details of why that was untenable at the time was the subject of a lawsuit, and beyond the scope of this missive. But the ironic thing was that once the idea of PC World was a reality, the first meeting of the new team took place in the very same Thai restaurant. Probably the most important memory is the inspiration of the founding Editor and a great friend, the late Andrew Fluegelman. Once Pat McGovern decided to fund our startup to compete with Ziff-Davis' PC Magazine, Andrew set out to define how we would make ours better. The answer, which may seem trite now, but wasn't then, was to aim the book at people who use computers, rather than "computer users" or "hobbyists." The innovation, then, was the extent to which we cared about making the technical information we were providing readable and literate. We started talking about this at the first editorial meeting at Andrew's office in Tiburon, overlooking Raccoon Strait and Angel Island. PC World was started a couple of days before the winter Comdex trade show in Las Vegas in November 1982. Once the magazine was announced, it was the talk of the show, and we spent a whirlwind week talking it up. That whirlwind didn't slow down until the first issue was out the door. One big highlight of the early days was the magazine's launch party, concurrent with the West Coast Computer Faire in March 1983, where we rocked the elegant St. Francis hotel. It was the culmination of four months of extraordinary effort and incredible teamwork, racing against time constraints, legal injunctions, inadequate office facilities, and the usual startup problems to get that first issue out the door. We got compliments about that party from all quarters for years to come. The party did stand in stark relief to our first offices: a converted apartment above a fruit stand on Taraval Street. It was immediately obvious that it was much too small. We had to time-share desks and computers. On the upside: a healthy snack was never more than a flight of stairs away. 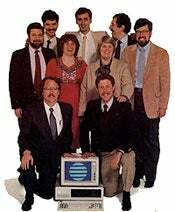 At left, from a 1983 ad, key editorial players from the early PC World. Front row: founder David Bunnell and editor Andrew Fluegelman. Second row: Larry Magid, Katie Seger, Jeremy Joan Hewes. Back row: Robert Luhn, Eric Brown, Harry Miller, Danny Goodman. When the first issue of the magazine appeared in early 1983, it made publishing history as the most successful first issue ever from an ad standpoint. In the early days we thought there would be dozens of word processors. One for doctors, another for students, another for mathematicians, and so on. The idea of one encompassing do-everything-for-everybody word processor (Microsoft Word) would have seemed ludicrous to us. For one thing, memory was precious and expensive, and for another, there were thousands of application software companies. In a way I think it is a shame how consolidation has really limited the choices we have, but on the other hand, we didn't see the Internet coming either. It's hard to remember how different things were in 1983. There was no World Wide Web, no Windows, no eBay or Amazon or Google and no i..well, no iAnything! Microsoft was just one software publisher among many, and people bought computers in computer stores (not from Gateway, Best Buy, or Sears). There were hundreds of companies talking to our editors and ad sales people about thousands of products. One 1983 PC World issue had nearly 400 pages of ads and product reviews, and most of those companies have since been acquired or forgotten. The early days of PC World magazine were an exciting time. There was an energy level that I had not experienced before or have since--even during my short reign as editor of PC World's predecessor, PC Magazine. PC World, like its predecessor, was the result of David Bunnell's vision and entrepreneurial guts. I didn't always agree with David, but I couldn't help admire his ability to dream up publications. David and I have kept in touch over the years, and I still admire him and consider him a friend. As far as PC World was concerned, David's most brilliant move was to hire my friend Andrew Fluegelman as editor-in-chief. I worked with Andrew at PC World and worked closely with him as he tweaked his groundbreaking piece of "freeware" called PC-Talk, the first communications program for the IBM PC and the forerunner of what we now call "shareware." Andrew was as smart and diligent at his work as he was charming--and he was very charming. He brought to the magazine a wit and a literary flair never before found on the pages of a technology publication. It set a high standard for all of us who wrote for the magazine and influences tech journalism to this day. With Andrew at the editorial helm, the magazine attracted a diverse and interesting group of writers--many of them fellow refugees from PC Magazine. For me, those early days were punctuated with frequent phone calls from fellow contributors Stuart Schwartz, Danny Goodman, and Jeremy Joan Hewes. Andrew and David also set an ethical standard that helped cement the bond of trust between editors, writers, and readers. PC World, like most publications, is a business that depends on advertisers for financial survival, but its core--what makes it worth reading-- is its editorial that depends on the trust of readers. PC World maintains that trust to this day. Although the magazine survived and continues to thrive, that Camelot-like early atmosphere came to an end in July of 1985 when Andrew's abandoned car was found near the North end of the Golden Gate bridge--only a few miles from his home in Tiburon, California. His body was never found, but and it was impossible to fathom why someone like Andrew might take his own life. The best guess of medical experts (Stuart Schwartz, one of our regular contributors, was also a practicing psychiatrist) was that it was a reaction to a prescription drug he was taking for colitis whose side effects can include depression and confusion. There have also been reports that he was diagnosed with cancer, but even his friends had no idea he was sick. Although I'd be delighted to write for PC World in the future, it's been years since my byline has appeared in the magazine. Yet, it helped launch my career as a contributor to general interest newspapers and media companies beginning with a column in the Los Angeles Times and now as technology analyst for CBS News and frequent contributor to the New York Times. Technology is now a mainstream story, but when PC World started it was still a niche market. PC World helped nurture that story and continues to lead the way. Looking back, I remain proud of PC World's contribution in the early days and proud of what it has become. In those early days of PCs and the real beginning of ubiquitous personal computing, the group of PC Magazine founders and initial staff--and essentially the same folks who left PC and started PC World--felt like late-20th-century pioneers of a sort. One clear memory I have is of seeing the original PageMaker, shown to us by its creator Paul Brainerd, at the PC World offices. Another moment that sticks with me is borrowing the first version of Windows from the office to try on my PC at home. But I never got to use it, because the PC Magazine-Ziff Davis lawsuit against former staff (I was among those sued) meant that everything I'd had from the old PC offices was held in "escrow" by lawyers. I never saw that Windows box again. My primary recollections of those first days of the magazine are of lots of fun, a couple hectic trips to Comdex, and staying up late to meet deadlines. I suspect that's not too different from what happens at PC World today.